When I was little, the best costumes came in small paper boxes from Eckerd drugstore. They were usually plastic aprons masquerading as princess dresses and were packaged together with a plastic mask that usually ended up being worn as a headband or not at all. The elastic stapled onto the ears of the princess face would break or the inside of the mask would get all sweaty with the condensation of the heavy breathing resulting from running from house to house. The older we got, the more creative the costumes. One year, with wigs and clothing from the salvation army, we dressed up as hobo clowns. Another year, using cardboard boxes and copious amounts of tinfoil, we dressed as robots. Ah, Halloween. Fun times. When we go into the workplace, we tend to put on the costume of someone we think we need to be instead of being comfortable in the street clothes of our authenticity. We worry about what people will think of us. It’s important. Perception impacts our reviews, our promotions and even our pay. We work harder to “fit in” instead of belonging (you can thank Brene Brown for that distinction). This doesn’t just happen in the conference room; it also happens in the corporate dining room. 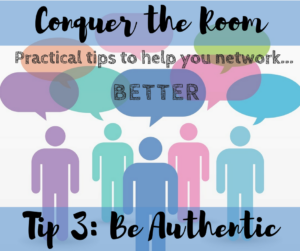 When you walk into a networking event, it’s going to take eight seconds for the people who see you to form an opinion of who you are and what you’re about. It will take eight to ten additional meetings to change that impression of who you were at that first moment. We want to be authentic, but we also want to make the best first impression that we can. How? We need to own our space, own our sticker, and own our speech. One of my favorite, favorite, favorite TED talkers is Amy Cuddy. Among the many things she talks about are the superhero stance and the power of presence. After a long day of work when you would really rather go home, turn on your favorite Netflix series and eat a bowl of cold cereal, you can’t because you have an event. Somehow, you’ve got to find the want-to to walk into the room confidently. Ok, I’ll admit it: I drive a mini-van. I resisted as long as I could but, seriously, you try fitting three full size car seats, two portable cribs and a double stroller in a Passat. The struggle is real, people, and mini-vans are the answer. There’s nothing inherently wrong with a minivan but it does come with a set of preconceptions that we make about those who drive them, doesn’t it? That’s why bumper stickers are so important. You see me drive up and you imagine I have kids in car seats and crushed cheerios on the floor and while this may be true, that does not define me. When I drive by and you see my 13.1 sticker, what you know about me changes (for those uninitiated, that’s the sign of a half-marathoner, not an incomplete bible verse). As you walk toward people in the room, they see, know, or believe something about you based on how you show up at the door. Our “sticker” is what we want them to remember about us when we leave. @taralynnfoster I am okay with you knowing that I’m a mini-van driver but ONLY if you also know the more important things about me that complete the package. When I’m being my authentic self, I can show you all of that. What do you want your bumper sticker to say? When you hear, “So what do you do?,” do you freeze? Do you ramble? The pressure is on to make an impression. By failing to prepare for this question, we stumble or say something so scripted it could have been canned by DelMonte. Stop doing that! The best way to respond authentically is to first ask yourself: will I talk about my position or my purpose? So that’s it for this week. Now you have three of the four tips: Be Prepared, Be Present and Be Authentic. It’s been kinda quiet out there – I really want to know what you think! Let me hear what’s been helpful and where you are still struggling. Hear Tara’s story and follow her at taralynnfoster.com, on linkedin, twitter or Facebook. Ready for your next conversation? Download my free cheat sheet! Want to know when the next post comes out? I am a wife to one and the mother of three (Don Diego, the biggest of the small ones, in our family). I am braver than I give myself credit for, love being surprised and hate sushi. I've tried, really, and it is just not happening. Thanks for clicking through. I'm glad you made it! Don’t Go in the Water: Where Did My Confidence Go?